Human resource management is a vital function of any organization, at the nexus of business practice, psychology, and law. 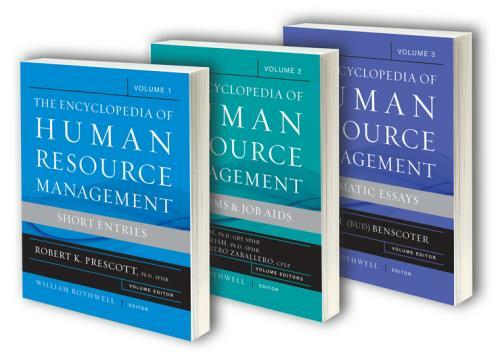 This one–of–a–kind and all–in–one print and online encyclopedia offers access to information on all manner of topics and issues related to the "people" side of business.Volume 1 covers an A–Z spectrum of all the key topics and issues related to human resource management, labor, and workplace policy.Volume 2 features hundreds of model employment forms, customizable or reproducible and compliant with current regulations.Volume 3 provides a summary of Employment Law, Labor Relations, and Human Resources Laws and Practices from over 250 countries, including key primary documents and links to citations to law in the natural language of the country. For students, researchers, and educators, theEncyclopedia will be a first stop on the way to more in–depth research. For entrepreneurs, managers, and employees, it will serve as an essential introduction and practical guide. For professionals in human resource management, it will be a handy reference.